Mes principaux intérêts de recherche sont l'épidémiologie des coraux et des poissons récifaux, les interactions microbiennes avec les hôtes, les rôles que jouent les pathogènes sur les interactions hôte/microbiome, et les moyens de gérer ou d'atténuer la propagation des maladies. Je travaille actuellement sur l'évaluation étiologique des maladies associées aux mortalités massives de poissons récifaux en me concentrant principalement sur 1) l’histoire évolutive des pathogènes responsables des épidémies 2) la recherche de réservoirs et vecteurs potentiels d'infection en période inter-épidémique et enfin 3) sur les relations hôte-microbiome-pathobiome-environnement (eco-épidémiologie). Participation au projet « Suivi et inventaire des récifs coralliens de Mayotte et des îles Eparses, SIREME », suivis des maladies coralliennes sur les récifs d’Europa et des Glorieuses. Séré, M.G., Chabanet, P., Turquet, J., Quod, J-P., Schleyer M.H. (2015) Identification and prevalence of coral diseases on three Western Indian Ocean coral reefs. Diseases of Aquatic Organisms 114(3), 249-261. Séré, M. G., Tortosa, P., Chabanet, P., Quod, J. P., Sweet, M. J., & Schleyer, M. H. (2015). Identification of a bacterial pathogen associated with Porites white patch syndrome in the Western Indian Ocean. Molecular ecology, 24(17), 4570-4581. Séré, M.G., Tortosa, P., Chabanet, Turquet, J., P., Quod, J-P., Schleyer M.H. (2014) Bacterial communities associated with Porites white patch syndrome (PWPS) on three Western Indian Ocean (WIO) coral reefs. Plos One. Massé, L.M., Séré, M.G., Schleyer, M.H. (2013). Sexual reproduction of Pocillopora damicornis (Cnidaria: Hexacorallia) along the high latitude shores of KwaZulu-Natal, Durban, South Africa. Western Indian Ocean Journal of Marine Science, 11(1), 55-65. Séré, M.G., Schleyer M.H., Quod, J-P., Chabanet, P. (2013). Hydrolithon sp. (Rhodophyta,Corallinales): a new threat for the massive coral Porites lutea in Reunion Island, Western Indian Ocean. Western Indian Ocean Journal of Marine Science, 11(1), 119-119. Séré, M.G., Quod, J-P., Chabanet, P., Schleyer M.H. (2012). Porites White Patch Syndrome: an unreporteddisease state from the western Indian Ocean reefs. Coral Reefs, 31:739. Van Os, N., Massé, L.M., Séré, M.G., Sara, J., Schoeman, D.S., Smit A. J. (2011). Effect of heterotrophic feeding on the survival and tissue growth rates of Galaxea fascicularis (Octocorralia: Occulinidae) in aquaria. Aquaculture, 330-333, 156-161. Séré, M.G., Massé, L.M., Perissinotto, R., Schleyer, M.H. (2010). Influence of heterotrophic feeding on the sexual reproduction of Pocillopora verrucosa (Scleractinia, Pocilloporidae) in aquaria. Journal of Experimental Marine Biology and Ecology, 395, 63-71. IFRECOR (2016). Etat des récifs coralliens et des écosystèmes associés des Outre-mer français en 2015,168p. Séré, M.G., Quod J-P., Turquet, J., Chabanet, P., Schleyer, M.H. (2013). 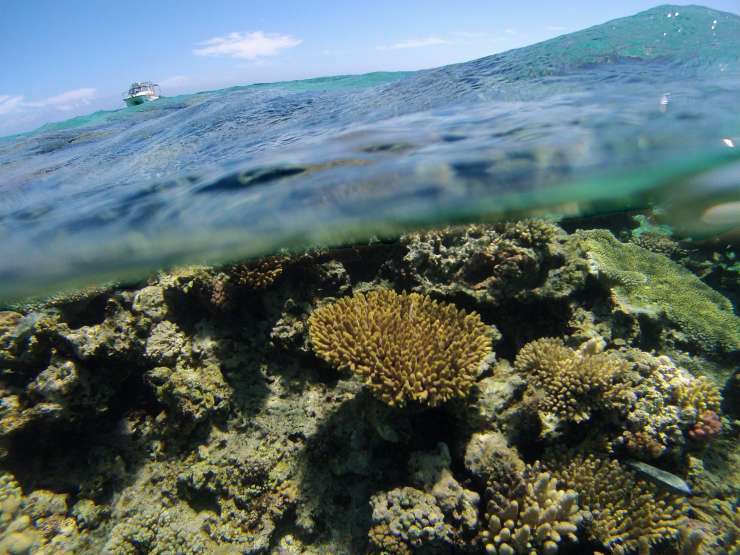 Effects of global warming on coral disease outbreaks in the Western Indian Ocean. Projet MASMA. pp 70. Séré, M.G., Quod, J-P., Turquet, J., Schleyer, H.M., Chabanet, P. (2013) Identification et étiologie des maladies associées aux coraux scléractiniaires dans le sud-ouest de l’Océan Indien (ETIMARECO). Projet FEDER, Europe, Région Réunion, DRRT, DEAL et MOM. pp. 74. Bourjea, J., Chadwick, P., Masse, L., Moksnes, P. O., Sere, M., Shah, N., & Yixiang, D. (2013). Western Indian ocean Marine Science Association Annual Report 2012. Lagabrielle E., Maina J., Massé L., Séré M., Watson R. (2010). Mapping anthropogenic drivers of change for biodiversity conservation planning in the Western Indian Ocean. Report prepared for: Marine Protected Area Network of the Indian Ocean Commission countries, Indian Ocean Commission Project implemented by WWF Madagascar & West Indian Ocean Programme Office, study funded by FFEM, 53 p.
Séré, MG., Tribollet A., Tortosa P., Chabanet, P. (2016). First coral disease assessment in marine sanctuaries in the south western Indian Ocean: Iles Eparses. 13th ICRS, Honolulu, Hawaii. Séré, M.G., Tortosa, P., Quod, J-P., Chabanet, P Schleyer M.H. (2013) Aetiology of white patch syndrome, a newly-reported disease affecting the massive coral Porites lutea in the western Indian Ocean. 7h WIOMSA Scientific Symposium, Maputo, Mozambique. Séré, M.G., Tortosa, P., Quod, J-P., Chabanet, P Schleyer M.H. (2012) Aetiology of white patch syndrome, a newly-reported disease affecting the massive coral Porites lutea in the western Indian Ocean. Conférence Run-Emerge, Saint-Denis, Réunion. Séré, M.G, Quod, J-P, Chabanet, P, Turquet, J, Schleyer M.H. (2011). Identification and spatio-temporal patterns of coral diseases on Reunion island reefs. 7h WIOMSA Scientific Symposium (Poster), Kenya. Séré, M.G., Quod J-P., Turquet, J.,Chabanet, P., Schleyer, M.H. (2010). Effects of global warming on coral disease outbreaks in the Western Indian Ocean. 9th MAMSA Grantees Meeting, Kenya. Séré, M.G., Massé, L.M., Schleyer, M.H. (2009). Influence of heterotrophic feeding on the sexual reproduction of Pocillopora verrucosa (Scleractinia, Pocilloporidae) in aquaria. 6th WIOMSA Scientific Symposium (Oral Presentation), Réunion. Massé, L.M., Séré, M.G, Smit, A.J., Schleyer, M.H. (2009). Sexual reproduction of Pocillopora damicornis at high-latitude off the Durban coast. Proc 47th MSSA, 8-11th Decembre, Durban, Afrique du Sud.